Superb Collectable Celebrating 50 Years of Space Achievements. 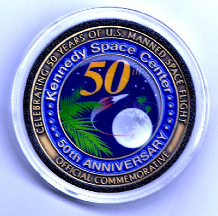 NASA KSC ANNIVERSARY MEDALLION - Contains metal flown Apollo and Space Shuttle missions! Historic First! This 1.75" diameter two-sided Medallion includes Apollo & Space Shuttle Flown Metal! On the reverse side is a montage of space achievements. Inscribed on this side is: 1962-2012 THIS MEDALLION WAS MINTED WITH METAL FLOWN ON APOLLO AND SPACE SHUTTLE MISSIONS.